it is about time, 16 hoppers finished and all the bugs worked out. That sure took a lot longer than I was hoping. next up to bat is to finish my first buck Jimmy. 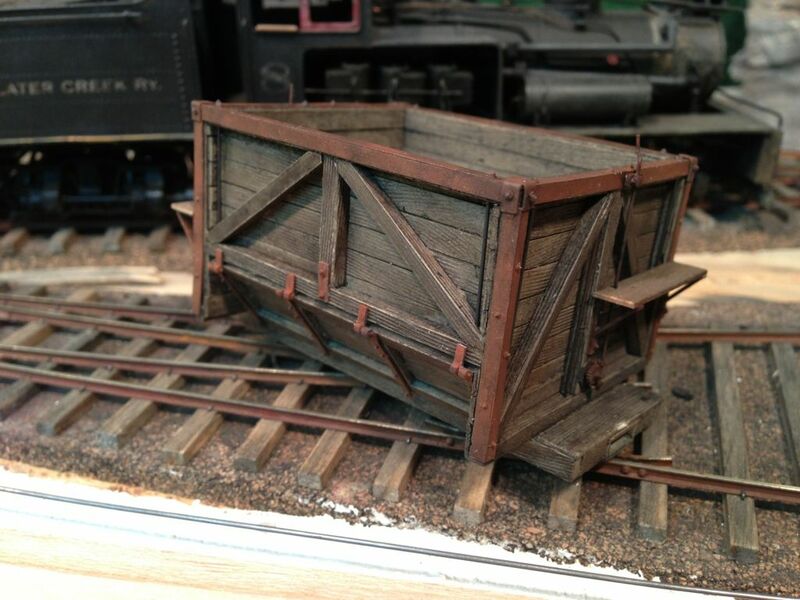 I also started to gather all the materials I need to do a hopper car build post. 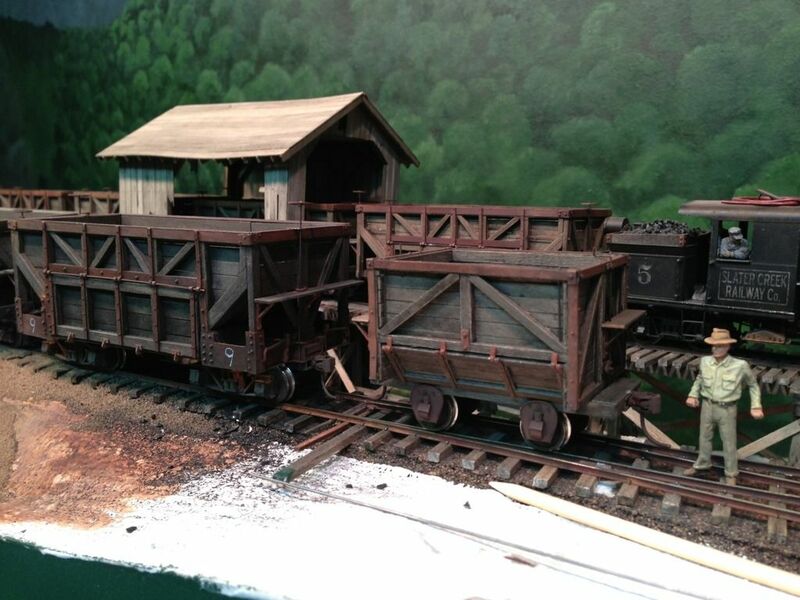 After that I will push the mainline to the big mine and get working on getting my mine to load the hopper cars. A very impressive array of cars, Jeff. A long time but a great result. The overall consistency of finish on your hopper fleet is impressive. All different, but within a narrow range. As much as we all like building an assortment of cars, a string of "all the same" looks really good! Quite a fleet of hoppers to be proud of no matter how long it took. Jeff, that string of hoppers looks terrific, and the buck jimmy is coming together nicely. I know what you mean about wait for parts. Modeling in HOn3 can project an annoying amount of that as well. Great string of cars they really look home brewed over a period of time in the life of a low budget RR. You should be proud of them. Here is the progress on the Buck Jimmy. I still have to add the brake wheel and do some final touch up on the finish...AND at the pedestal journals, which I am still waiting for. Good thing it takes so long to scratch build the bodies of the rolling stock to kill the time it takes to wait for parts. Maybe if I am lucky they show up now that I am almost done. Enough ranting, while working on the car I noticed some errors in the drawing in the Manns Creek book. If you compare the photo of the wrecked cars to the drawing of the car on the previous page you will notice that the foot boards do not span the entire width of the car like the drawing shows (sorry if you don't have the book). if the foot boards only go halfway across the end of the car it puts the foot board support on the middle vertical frame member, which is where the drawing shows the door operating gear is, which won't work. In the same photo of the wrecked Buck Jimmys you can see that there are two chains that pass through holes in the main frame members, those chains are attached to the bottom of the doors, pass through the main frame members and go under the center sloped floor to a rod that runs the length of the car. the drawing in the book shows this rod to be high above the floor but I believe the rod is down low and the chains are almost horizontal. If the horizontal door rod was above the floor the chains would have to be above the floor and would be pinned to the floor once the coal was loaded and the doors would never open. Since there are no photos that prove any of this I went with my guy feeling and made my door rod and gear low. To make the door operating gear I just shaved off a Grandt Line brake ratchet gear and used some styrene to make what looks like a worm and gear using the big gear from the Grandt Line part. 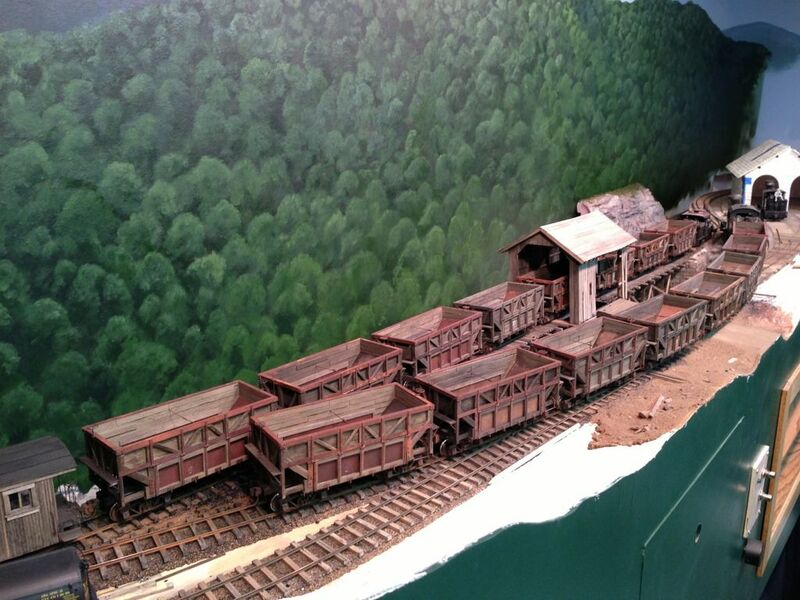 You have done a remarkable job on this layout. 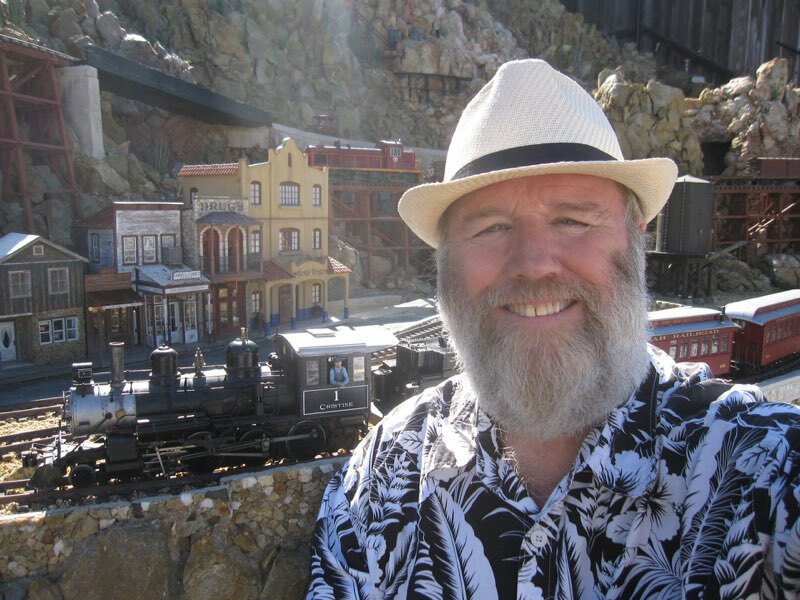 I have followed your threads and the fact that you have the hopper actually dumping coal is impressive. I like the Buck Jimmie cars too. Thanks for sharing your techniques and layout. In the left side of the photo- that looks about a 11,000% grade climb.. must be a little bit hard on the engines, eh? that is funny that you mention the lift, looking that photo I have been bugged by that lift bridge. 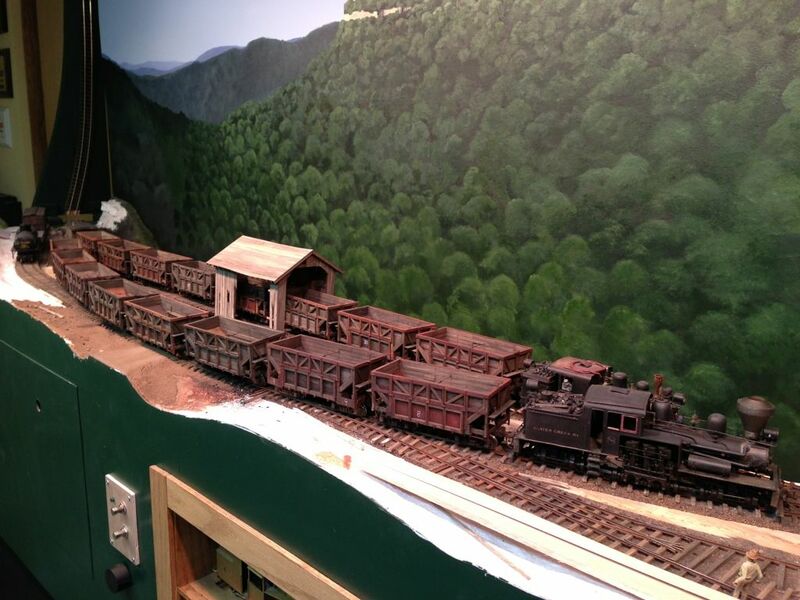 I am thinking since I have not finished painting the backdrop maybe I should change that end of the layout to have the backdrop curve in that corner and meet the front edge of the layout, then the track will pass through the backdrop and I can use a road bridge to hide it. what keeps me from changing it is that I hope to someday add on to the layout on this end when I move and it will be easier if I leave it as is. 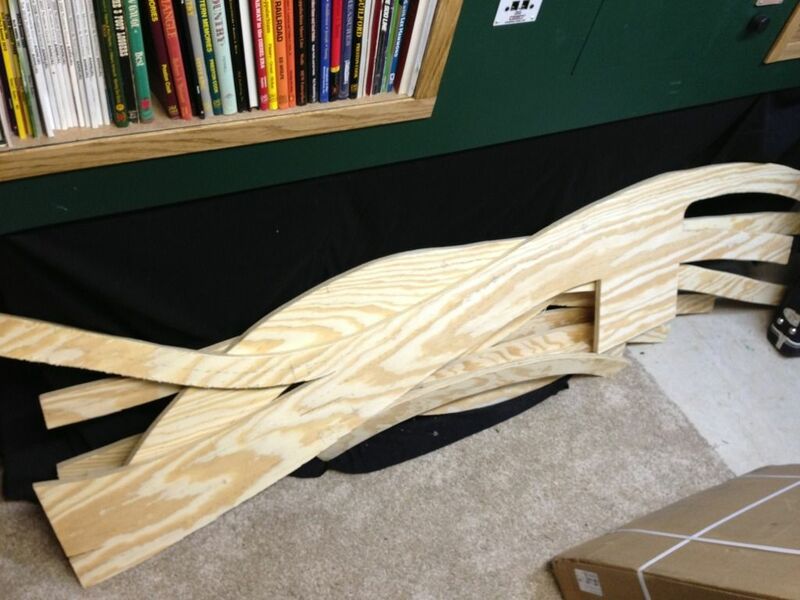 I just bought some plywood to make some more roadbed, just working out the final details of the track layout at the mine. I finally got my journals from Boulder Valley models and guess what, they are way too small! BVM's Buck Jimmies must be scaled down a bit because they look good under theirs, I built mine according to the drawing in the MC book and the car is actually bigger than I thought. Anyways, I scratch built some journals from styrene to work out the design, once I am happy I will make a good master and cast my own for the future cars. here is a photo of the car with my journals on it, they are not finished, I have them a little too high and I have to get the bearings in them, then I will add the truss rods under it. I also made layout progress last night. I decided to just sit down and figure out how to use Templote myself. The program is not that easy for Americans to learn because it used terminology that we don't to describe parts of the turnout or actions to perform to modify the turnouts and track. Also the tutorials are visual and there is not audio, so you have to watch carefully and figure out what they are clicking on and what it is changing on the templates. They use terms like "snake", "slew", "V-angle", "K-angle", etc. I got it though, and in the end I feel it was worth the effort, especially if you handle track, this program will give you very good custom templates and it won't let you cheat so your track will run well. 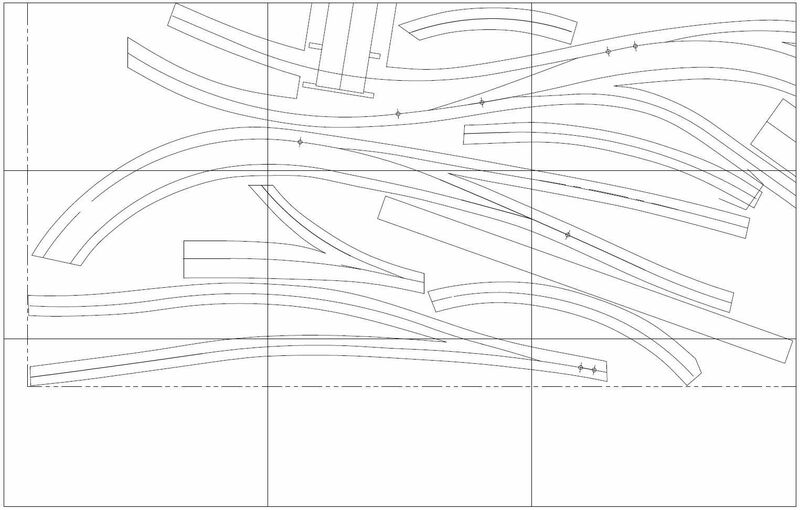 After I finished my track plan in Templote I exported it as a DFX file and opened it in AutoCAD, then I outlined the track where I wanted the roadbed to be. After I got the roadbed all drawn up I laid out all the roadbed pieces so they fit on one sheet of 3/4" plywood with little waste. 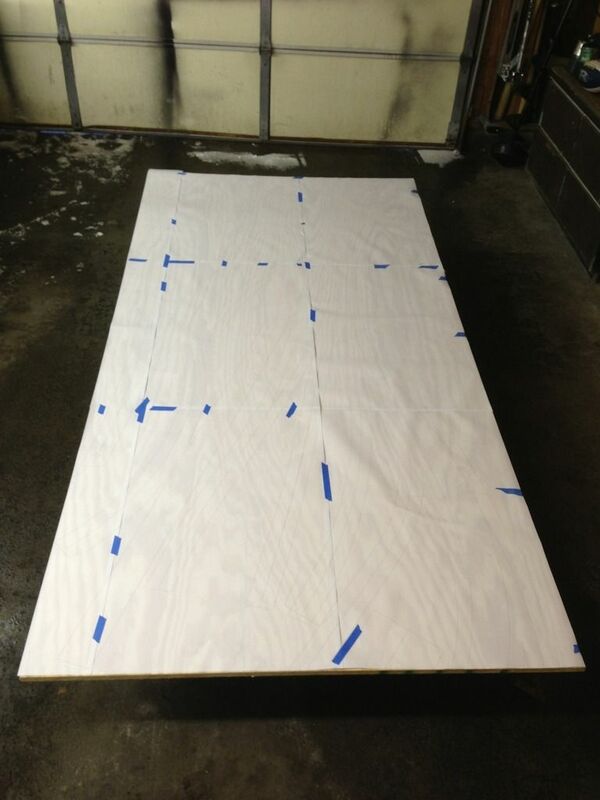 My plotter will only print ANSI-D sized prints, which is 34" x 22" so I divided up my 4' x 8' plywood into 34" x 22" sheets and plotted them out full size. here is the plan in Templot. 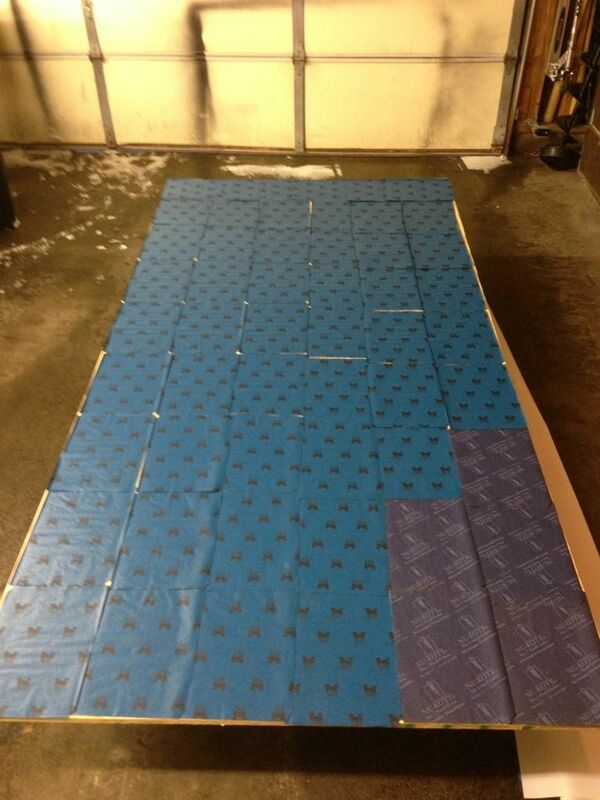 Once I got the plots done I set up the sheet of plywood in my cold Minnesota garage, with 12" of fresh fallen snow outside I must add, fired up my propane heater an taped all the sheets of paper together to form a full 4' x 8' paper pattern. with the paper pattern all taped together I lifted it off the plywood and laid out sheets of carbon paper, carbon side down of course, and replaced the paper template, which I taped in place so it would not move. then I took a dull pointed pencil and traced the roadbed, marked the holes for the switch machine motors and drew dashed lines for the track center lines. It took a while to get that all set up and the lines all traced, and my heater ran out of propane, AND my wife decided to come home at that time and opened the garage door which let out the little heat I had made so I used a pretty aggressive saw blade in my jig saw to get the roadbed cut out fast, which kind of chipped up the cut edge a bit, but hey, this is roadbed and it does not have to be pretty, it will be covered with scenery someday anyways. here is the roadbed all cut out and hauled into the train room for it to dry out a bit. Jeff, boy you are right about the relative "bigness" of the MC buck jimmies. I've built several of the larger MC hoppers (from kits) and always viewed them as "way to big" for On30....I've also got several of the BVM buck jimmies built up and they are indeed much smaller than the car you've built. Seeing the two of the them side by side in the photo shows just how big the MC jimmie was....the capacity of the car was pretty good compared to the later 2 truck cars. Jeff, I've been following along on this and think your hoppers are beautiful. I've opened Templot a couple times, but I can't seem to get out of the starting blocks. I guess I need to make more of an effort, seeing what you and a couple others on the RR-Line have accomplished with it.